ഇത് സെർബോ-ക്രൊയേറ്റ് (Serbo-Croat /ˌsɜːrboʊˈkroʊæt, -bə-/, ),സെർബോ-ക്രൊയേറ്റ്-ബോസ്നിയൻ(Serbo-Croat-Bosnian (SCB),) ബോസ്നിയൻ-ക്രൊയേഷ്യൻ-സെർബിയൻ ( Bosnian-Croatian-Serbian (BCS), അഥവാ ബോസ്നിയൻ-ക്രൊയേഷ്യൻ-മൊണ്ടിനെഗ്രിയൻ-സെർബിയൻ (Bosnian-Croatian-Montenegrin-Serbian (BCMS), എന്നും അറിയപ്പെടുന്നു. സെർബിയ, ക്രൊയേഷ്യ, ബോസ്നിയ മൊണ്ടിനെഗ്രൊ എന്നിവിടങ്ങളിലെ പ്രധാന ഭാഷയാണിത്. നാല് മാനകരൂപങ്ങളുള്ള ഒരു ബഹുകേന്ദ്രീകൃത ഭാഷ ആണ് (pluricentric language)  . ↑ "The Slavic Languages" (PDF). Cambridge Language Surveys. ശേഖരിച്ചത്: 19 June 2017. ↑ "Constitution of the Republic of Kosovo" (PDF). p. 2. ശേഖരിച്ചത്: 2012-08-17. ↑ "B92.net". B92.net. മൂലതാളിൽ നിന്നും 2013-11-10-ന് ആർക്കൈവ് ചെയ്തത്. ശേഖരിച്ചത്: 2013-09-01. ↑ "Minority Rights Group International : Czech Republic : Czech Republic Overview". Minorityrights.org. ശേഖരിച്ചത്: 2012-10-24. ↑ "Minority Rights Group International : Macedonia : Macedonia Overview". Minorityrights.org. ശേഖരിച്ചത്: 2012-10-24. ↑ Hammarström, Harald; Forkel, Robert; Haspelmath, Martin, eds. (2017). "Molise–SKB". Glottolog 3.0. Jena, Germany: Max Planck Institute for the Science of Human History. ↑ Čamdžić, Amela; Hudson, Richard. "Serbo-Croat-Bosnian clitics and Word Grammar" (PDF). UCL Psychology and Language Sciences. ശേഖരിച്ചത്: 11 September 2013. ↑ Thomas, Paul-Louis; Osipov, Vladimir (2012). Grammaire du bosniaque, croate, monténégrin, serbe [Grammar of Bosnian, Croatian, Montenegrin, and Serbian]. Collection de grammaires de l'Institut d'études slaves ; vol. 8 (ഭാഷ: ഫ്രഞ്ച്). Paris: Institut d'études slaves. p. 624. ISBN 9782720404900. OCLC 805026664. Lay summary. ↑ Mørk, Henning (2002). 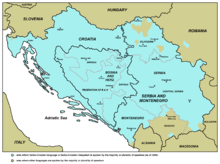 Serbokroatisk grammatik: substantivets morfologi [Serbo-Croatian Grammar: Noun Morphology]. Arbejdspapirer ; vol. 1 (ഭാഷ: ഡാനിഷ്). Århus: Slavisk Institut, Århus Universitet. p. unpaginated (Preface). OCLC 471591123. ↑ 1.0 1.1 Kosovo is the subject of a territorial dispute between the Republic of Kosovo and the Republic of Serbia. The Republic of Kosovo unilaterally declared independence on 17 February 2008, but Serbia continues to claim it as part of its own sovereign territory. The two governments began to normalise relations in 2013, as part of the Brussels Agreement. Kosovo is recognized as an independent state by 104 out of 193 United Nations member states.